Curb appeal ideas are all about the details. Whether using landscaping, color, or features to make your porch "POP", paying attention to the little things can make huge differences. 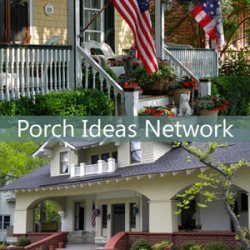 You can add appeal to your porch other than using only colorful pillows, furniture, wall hangings, etc. 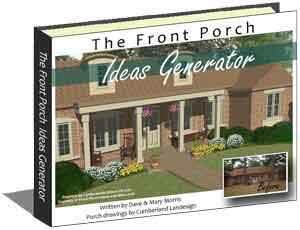 We share ideas on adding extra appeal right on your porch - the columns, steps, lighting, flooring, front door and more. Great curb appeal ideas are created in a variety of ways using everything from landscaping to color, architecture, and features. It all has to blend together to create a warm and inviting look. 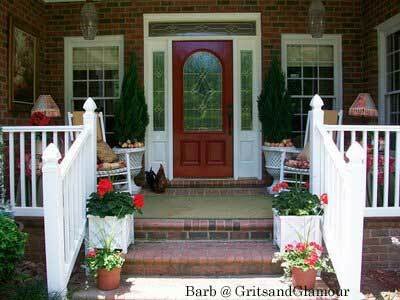 Let's start with your porch itself, from the steps to the front door. 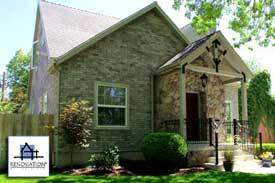 In Part I, we'll give you even more curb appeal ideas for your adjacent landscaping and colors. 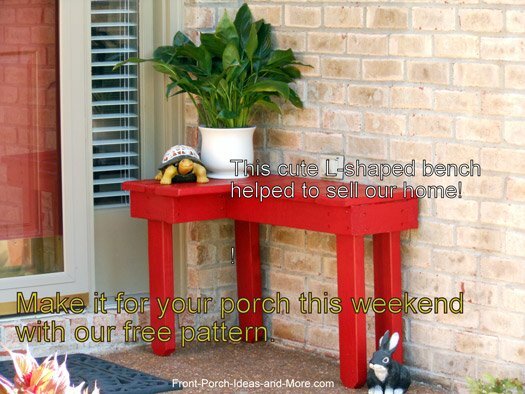 This cute L-shaped red bench warmed up our small porch so much that the people who bought our home wrote the bench into the contract. Make this sweet little bench for YOUR porch - or surprise someone with it. It's perfect for decorations and packages. Dave designed it himself. Enjoy our free bench pattern. The little guy's name on the bench? It's Fred and he's cool! 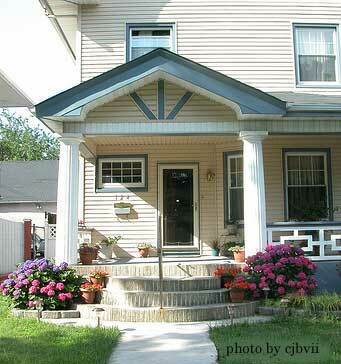 You usually don't think of your porch steps as a major consideration for curb appeal. But look at the photo at right (courtesy of cjbvii). Notice how the owners "rounded" their steps to create a soft look. You can't help but notice them as you approach the porch. Replace these with ordinary squared steps and you get a totally different look. 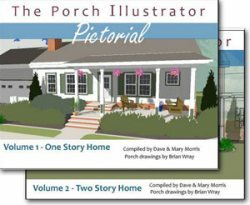 Porch columns can be an easy change. 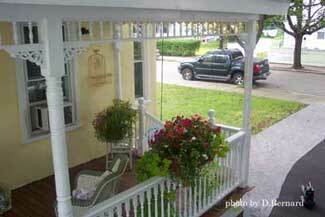 Notice the round fluted columns on this porch. It gives it a bolder look. If these were replaced with standard 4x4 posts, they wouldn't stand out. You can purchase column wraps that go over your standard 4x4 or 4x6 columns to dramatically change the look. 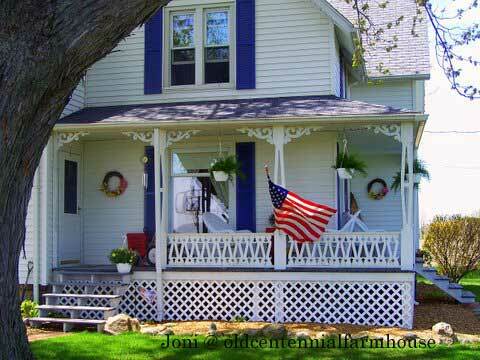 In the picture above (courtesy of Joni at Old Centennial Farmhouse), note how the railings accentuate the look of this country porch. Now imagine how it would look with traditional vertical balusters - not the same for sure. 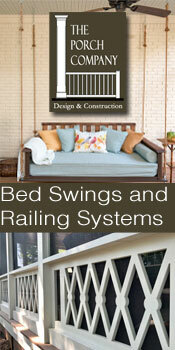 Although a little labor intensive, changing your railing system can have dramatic effects. Also consider using custom vinyl railings - a very good option. Also take note of two other neat features on Joni's porch. 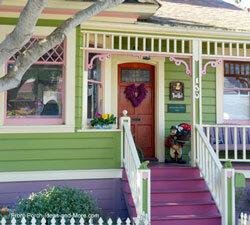 First, she painted the skirting (the lattice under the porch to match the trim work. 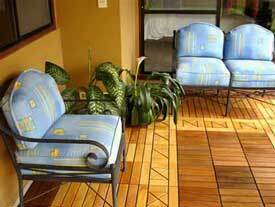 Another option you might consider for your porch are custom lattice panels. 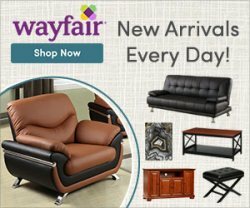 They come in designer styles or you can have them customized to your specifications. And, last but not least, look at Join's brackets (at the top of the columns). These are decorative pieces that add real charm to any porch. Exterior trim comes in a variety of styles and is easy to install. 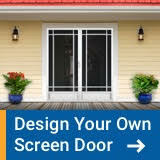 Changing or enhancing what you already have should be included along with other curb appeal ideas. In D. Bernard's picture at right, notice how she combined both brackets and spandrels (the decorative piece connecting the tops of the columns) to create an even more dramatic and warm look. Take note of the front door in the picture above. A pediment was installed over the door to give it a bolder yet more welcoming look. It blends well with this the porch's architecture. You don't often find pediments installed on doors that are protected by a roof; yet, it works well on this porch. 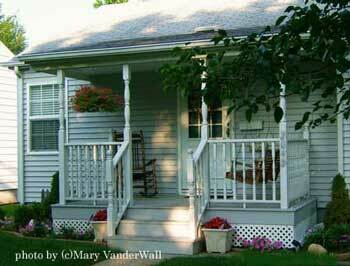 Small porches can have great appeal as well and can do much to enhance a small home. 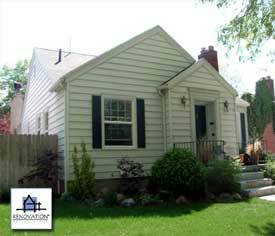 The porch at right (courtesy of MVanderwall) is a good illustration of what can be done. Instead of standard 4x4 columns, owners went with both colonial-style columns and balusters for the railings - it really softens the look of the porch. In addition, painted skirting to match the trim colors and a well placed rocker and small porch swing make this a small inviting porch. I might even add brackets and spandrels to create even more charm! Change the color of the front door. A fresh color instantly upgrades your entire home and makes the door "pop". 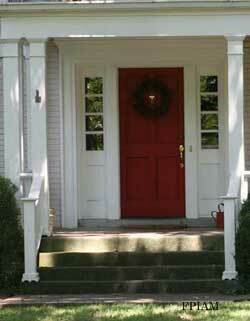 Tile or paint a door with a design that contrasts with the porch floor or front stoop. We have just the color charts to help you select the right combinations. 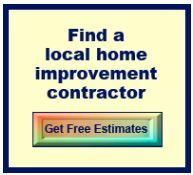 Hardware: Make sure your door hardware (hinges, handles, door knockers) are in good repair. Also make sure your doorbell is updated for a fresh clean look. Flooring or Decking: you'd be surprised at how much this can affect curb appeal. New paint, restored wood flooring, repaired concrete, or even updating with interlocking tiles can make a huge difference and they are so easy to install. 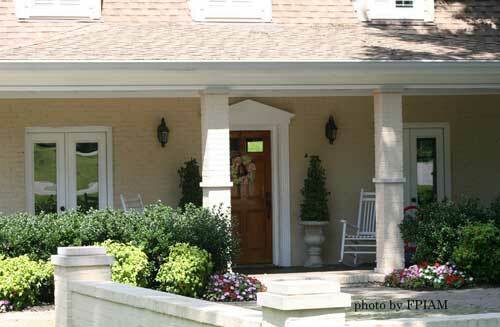 Architecture: Perhaps the most striking curb appeal ideas come from the redesign of your existing porch. 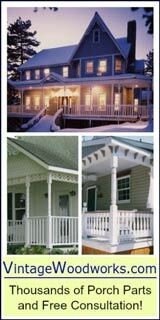 A experienced architect can turn your existing porch into an exquisite looking one like the "before and after" pictures below from the Renovation Design Group.